How do you double, triple or even quintuple the size of your staff virtually overnight without making bad hiring decisions? Whether you’re hiring for startups or recruiting for a larger company expanding a burgeoning department, finding the right people can make or break your business. Time is of the essence, and there is little margin for error. Hiring strong employees is a challenge under normal conditions, and it only becomes exponentially more challenging when a business is scaling rapidly. The following tips will help you efficiently and effectively recruit, screen, hire and retain the people who will fuel your company’s success. It may sound simplistic, but to avoid wasting precious time, you must know exactly who and what you’re looking for. The foundation of any good business is a strong company culture. This should be your guiding light for the type of people you hire and how you intend them to interact with each other. From there, work backward to identify what the ideal team structure looks like. What are the key roles you absolutely must fill, and what skills must an individual in each role possess? What positions, if any, are secondary? Perhaps those roles can wait until a second wave of hiring. It’s important to prioritize the required skills to identify what may be strict requirements versus nice-to-haves. Must they hold certain certifications or degrees? Is there a minimum years of experience required? Are you flexible on these criteria? This helps your company snag as many potential candidates as possible for the initial screening, which hopefully brings more qualified prospects to your door. Don’t drive away good candidates by keeping non-essential requirements in your job listings. Now go a step beyond the job description and think about how the teams and team members will fit into your desired culture. What qualities do your top performers exhibit? Does your company adore individuals who work well under tight deadlines with minimal supervision? Or, is your company more team-oriented — with emphasis on collaboration and group decision making? There are no right or wrong answers. What matters is alignment with your corporate culture. Your goal here is to define success based off your existing and desired employees. Then build a replicable and scalable process for identifying individuals who fit your criteria. Plus, if an employee works well in your environment, they’ll tend to stay longer and grow with your company as your business needs change. You’ve mapped out the ideal team. Now you must put your plan into action. Finding and hiring more candidates, particularly if you’re searching for in-demand tech workers, will likely require creativity from your hiring team. Simply posting a job to your company site, Indeed or CareerBuilder won’t be enough for high-volume hiring. Employee referrals are a tried-and-true method for finding good candidates. It’s not full-proof, but it is a good bet that your smartest, hardest-working employees have like-minded friends and relatives. Don’t just ask your top performers to refer their friends and former colleagues. Encourage everyone in your company to become a recruiter by offering a monetary reward. The amount of the reward should be large enough to motivate your staff into action. That may mean you offer $250 for a cashier job and $1,500 for a professional position if they’re still with your company after 90 days. Regularly remind employees of your referral program through company-wide emails, flyers and in staff meetings. Managers may develop tunnel vision when it comes to hiring — particularly when a company is growing fast. Each director knows who they need to hire but may forget about other departments and their hiring needs. In the realm of a rising tide lifts all boats, make sure all your hiring managers keep other departments in mind when screening and interviewing candidates. For instance, an admin candidate may not be a good fit for the accounting department but could be a strong fit for HR. When your company is growing rapidly, every hiring manager needs to participate in finding excellent employees. Considering all qualified candidates remains an excellent way to scale staff in a short amount of time. Some managers may be drawn to candidates who look and act like themselves or previously successful hires. To give qualified candidates a chance, it’s important not to make assumptions about age, gender or disabilities. Focus on the person’s skills, attitudes and whether they’re well prepared for the interview. Are they committed to learning and growing in their line of work? Will they add a positive disposition to the team? Do they have all required certifications and experience? If you and your hiring managers have preconceived ideas about who is right for a job, you may very well miss an excellent candidate. A text campaign can dramatically speed up the initial screening process. To do this, rather than asking candidates to fill out a long online form or to call a recruiter, list a number to text for more information. Do you have a Microsoft Certified Solutions Developer (MCSD) certification? Some candidates prefer to communicate by text rather than calling or filling out a long online form. Once you’ve performed an initial screening, you can move on to a more in-depth telephone call later. Fast-growth companies must streamline their recruiting processes, invest in efficient HR technology, make offers in a timely manner and focus on finding people with the skills they most need. You don’t want to miss hiring a good candidate because the person grew tired of endless rounds of interviews or were unable to take half a day from their current job to drive to your in-person screening interview. Even during hiring crunches, it’s essential your company keep current employees satisfied and motivated. After all, these are the people who’ve made your current success possible, and it will be a significant challenge to grow if you’re busy replacing existing workers rather than focusing on new hires. To do this, make sure your onboarding process creates a favorable early impression and helps new employees settle in. Invest in the tools, training and development your staff needs to help the company grow. Conduct regular climate surveys to find out what employees think about the growth and whether your corporate culture is changing in an unhelpful direction. Nurturing current employees ultimately helps support recruiting because happy employees share their experiences on social media and in person with those in their community. This helps advertise your workplace culture, which in turn lets your company become an employer of choice for high-value candidates. Is recruiting for startups or your high-growth, maturing business getting you down? Let Insperity help. 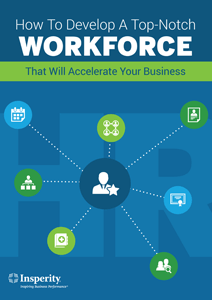 Download our free e-book: How to develop a top-notch workforce that will accelerate your business.